GALLIMAUFRY A hotchpotch, jumble or confused medley. Gallimaufry derives from music written by Guy Woolfenden for the Royal Shakespeare Company�s (RSC) productions of the Henry IV plays, 1982. Woolfenden's time spent with The Royal Shakespeare Theatre led to many works for wind. Gallimaufry is one of our favourites. It is a wonderful example of ancient meets modern. We recorded this at our concert at All Saint's Church, Crowborough, in May 2011. Illyrian Dances: The precise location of Illyria was not important to Shakespeare; what excited him was the resonance of the word itself and the romance of all far away, make-believe places. Illyria is �Never Never Land�, and the composer was intrigued with the idea of inventing dances for such a place. �Illyrian Dances show this composer to be real master of the medium, exploiting with colourful writing all the timbres of wind instruments, sometimes in unexpected parts of their compass. 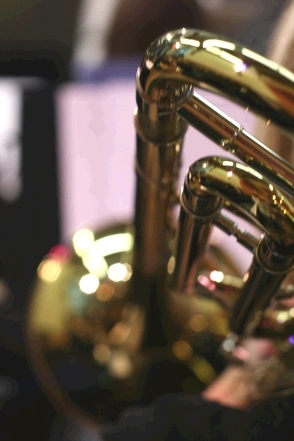 It is enjoyable music to play and to listen to.� (Winds Magazine).